Bring the quinoa, 1/2 teaspoon salt, and 1 1/4 cups (285ml) water to a boil in a medium saucepan over high heat. Reduce the heat to medium-low, cover, and simmer until the quinoa is tender (about 10 minutes). Remove the quinoa from the heat and let it stand, covered, for 5 minutes. Then fluff the cooked quinoa with a fork, and spread it out on a large, rimmed baking sheet to cool. Meanwhile, prepare the dressing: In a small bowl, whisk together the lemon juice and garlic, then gradually whisk in the olive oil. Season the mixture with salt and pepper to taste. 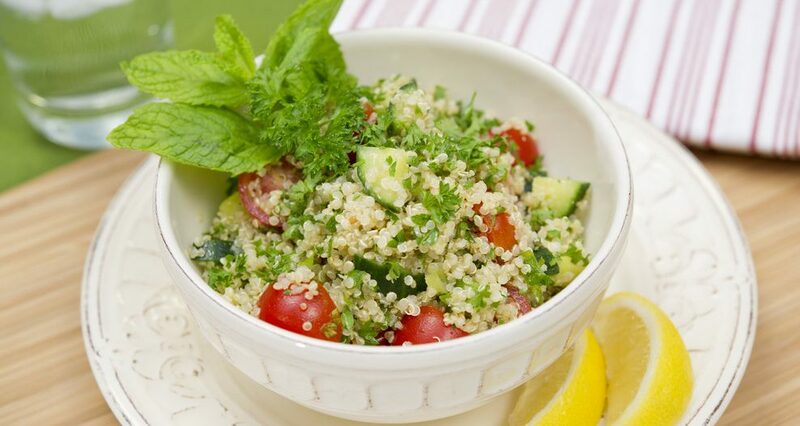 Transfer the cooled quinoa into a large bowl and mix in 1/4 cup (60g) of the dressing. Add the chopped cucumber, tomatoes, herbs, and scallions and toss together. Season to taste with salt and pepper, and drizzle any remaining dressing over the mixture. Tip: This recipe can be made one day ahead of time. Cover the remaining dressing and quinoa separately and chill before combining and serving.